THE 650,000-square-mi (1,600,000-square-km) Gobi is the largest desert in CHINA and MONGOLIA; both the Taklamakan Desert (in XINJIANG) and the Changtang Desert (in TIBET and Qinghai) are only half the size. Only the SAHARA is bigger than the Gobi among the world’s deserts. 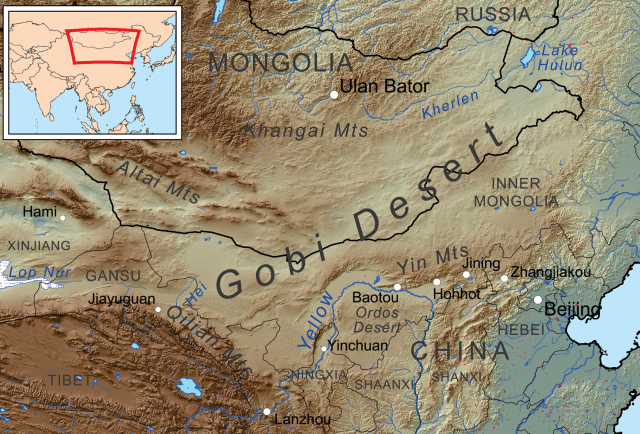 The Gobi separates the Republic of Mongolia from the province of Inner Mongolia in the People’s Republic of China (PRC). In Mongolia, the Gobi occupies all the southern districts (aimak) of the country: eastern Gobi, central Gobi, southern Gobi, Baian Khongor, and Gobi Altai. In China, the Gobi Desert extends from Manchuria to Gansu and Xinjiang. It consists of several plateaus: Hulun Buir, Xilin Gol, and Ulanqab in the east and the Alashan plateau in the west of Inner Mongolia. The Yinshan Mountains and the Hexi corridor form the southern edge of the Gobi Desert. Athough vast, the Gobi peneplain is neither the driest nor the warmest desert in western China. The Siberian high-pressure system keeps the Gobi dry and very cold in winter; in summer, the monsoon winds bring a few inches of precipitation to the region. The meager vegetation and the brief growing season account for the barren appearance of the Gobi. Topographical profiles of Inner Mongolia display a succession of denuded hills covered with gobi pebbles and basins covered with sandy gobi gravel. Gobi or govi usually means “desert” in Mongol, although an absolute desert would be called tjall or “waste.” Gobi designates also the winderoded small basins that are scattered in the desert. Chinese geographers establish a difference between sandy desert (shamo) and gravel desert (gobi). They call gobi the gray surface of hard pebbles that covers dilluvial plains. Sand dunes are indeed rare in the Gobi Desert. The Gobi enjoyed a semitropical climate during the Cretaceous period (145 to 160 million years ago). The paleontologist Roy Chapman Andrews organized, in the 1920s, the Central Asiatic expeditions of the American Museum of Natural History. He discovered rich repositories of dinosaur fossils in what is now a forbidding desert, with badlands and salt flats. The two characters in Chinese to transcribe Gobi are ge, “halberd,” and bi, “wall.” Combined, they suggest that this type of desert constitutes either a dangerous obstacle or a formidable protection. No major road crosses the Gobi Desert except for the imperial highway from Kalgan (Zhangjiakou) to Ulaanbator and the much more recent Transmongolian railway that links Beijing and Ulaanbator via Baotou. The Gobi plays today an unexpected role in space-based international communications as the launch site for Chinese Long March rockets; the Jiuquan launch site lies in the western Gobi Desert (Gansu province).